Harry Potter has not only spawned an essential book series and groundbreaking film franchise, but also a whole new branch of fan-fueled tourism. The latest location to cash in on the fervor for The Boy Who Lived is The Georgian House, a London hotel that's looking to cater to all the Potterheads with wishes to spend a night in Diagon Alley. 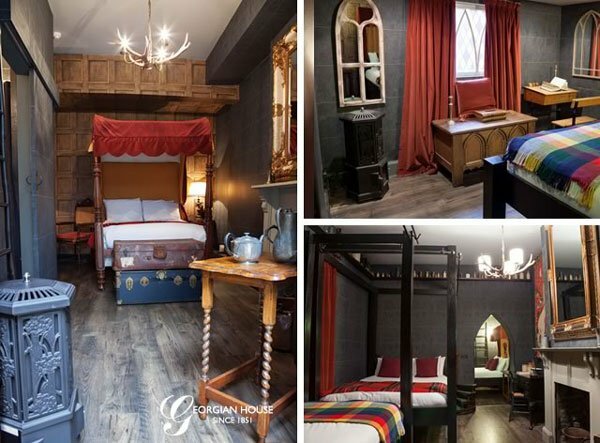 The Georgian House has converted two of their rooms to look like they are straight out of the magical world of Harry Potter. While the accommodations seen in the pictures below appear modest, they boast wifi and come with a full English Breakfast, all for about $337 a night. But sleeping in a four-poster bed, surrounded by cauldrons and other gothic details is just the beginning of the possibilities for Harry Potter tourism out of The Georgian House. As scenes from the Harry Potter series have been shot throughout central London, Potterheads can treat themselves to special "Harry Potter Package Deals." For example, for just over $400 a night, you and a friend could share a room in one of the Wizard Chambers for a night, tuck in to the aforementioned breakfast, then dash off to the Muggle Tour, the #1 Harry Potter Tour of London. Highlights of the tour include the entrance of the Leaky Cauldron pub, as seen in Harry Potter and the Prisoner of Azkaban, locales where death eaters ran amok in Harry Potter and the Half-Blood Prince, and the visitor's entrance to the Ministry of Magic, as seen in Harry Potter and the Order of the Phoenix. There's a lot more to this tour, check out the website to really dig in. Images courtesy of The Georgian House.